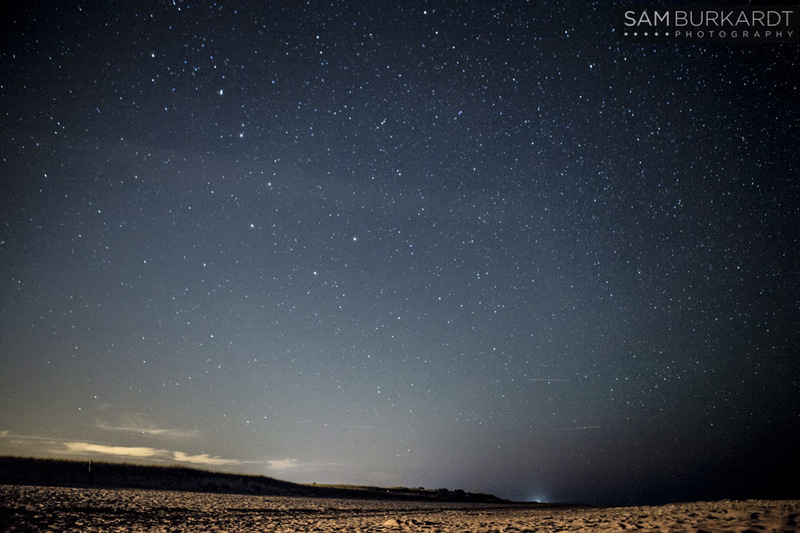 From the day I posted the photo of my sister, Lauren, looking up to the milky way on that gorgeous night at Nauset Beach in Cape Cod, MA, I am continually asked a few of the same questions: "How did you do that?!" "Did you plan this concept out?" "What were your camera settings?" "Is it real?!" and a bunch more. I'd love to explain everything to you all right here, right now. I'm extremely proud of this photograph, and I am already planning on creating new versions with this concept over the summer! Did you plan this concept out? Nope! It was a spur of the moment, I-need-a-new-adventure-now kind of idea. I was on vacation with my family in Cape Cod, our annual trip, driving around the family-friendly vacation hotspot at 10pm with Lauren, bored to the high heavens. "If we don't do something new right now, I'm going to freak out." I adore Cape Cod, but I was starting to feel like I had seen it all and Lauren was in the same boat. I looked up and noticed a few stars out and suggested stargazing. We went to Nauset Beach around 10:30pm and didn't realize what we were in for. As we walked along the lengthy boardwalk amidst the high sand dunes on that crisp night to get to the beach, the most surreal feeling came over the two of us. We were walking into space. It was pitch black in front of us and impossible to see the horizon. We slowed down to let our eyes adjust and that's when mother nature really started to work her magic on us. Stars. Everywhere. We were overwhelmed at the sight of how the sky was ablaze with the milky way and the cosmos. We laid there on the beach and watched the stars dance in as each second passed. After the shock wore off a bit, I began to try and figure out what to do with this masterpiece of a sky I was given. It wasn't easy! The first night was a bust. I had never really attempted to do night shots before, but how do you let something like this get past you? I had no tripod, no flash, and it was starting to get bitter cold. Lauren is an absolute peach for putting up with my direction that night. I still tried to get a few shots, but they were nothing that I was particularly proud of. I was ready the second night. What were your camera settings? I knew I wanted to have a bit of rim light, make Lauren stand out and make sure that my star trails weren't too long. For my photo lovers - I was using bulb! I ended up liking how 18 seconds looked in camera, had Lauren pop the flash at 1/16 power (didn't have pocket wizards or a light stand at the time either) after I held the shutter while I held my breath. My ISO was set to 2500, I had a shallow aperture of f/2.8, and I was using my 24-70mm Canon Lseries lens with my 5D Mark II. It's super real!! I did tweak the color a bit, removed some lifeguard chairs, and uped the clarity, but it's not a composite image. I think that's one of the biggest reasons of why I'm so proud of this photo. I still have plenty to learn about photographing stars, so you'll be seeing a lot of photographs of them this summer! Keep scrolling down to see a few photos from that awesome night on the beach last summer! Check out the award this photo won!